When I first started making soap, I got into a conversation with a relative who was really interested in making it herself. But, she said she had quickly become overwhelmed with all of her research and said it seemed like the supplies would be really expensive. Well I’m here to tell you, it’s really not! I can see how she got overwhelmed, bouncing from recipe to recipe, and tutorial after tutorial. But that’s like someone learning how to cook without having even a spoon and having to stock your whole kitchen for 100 recipes! 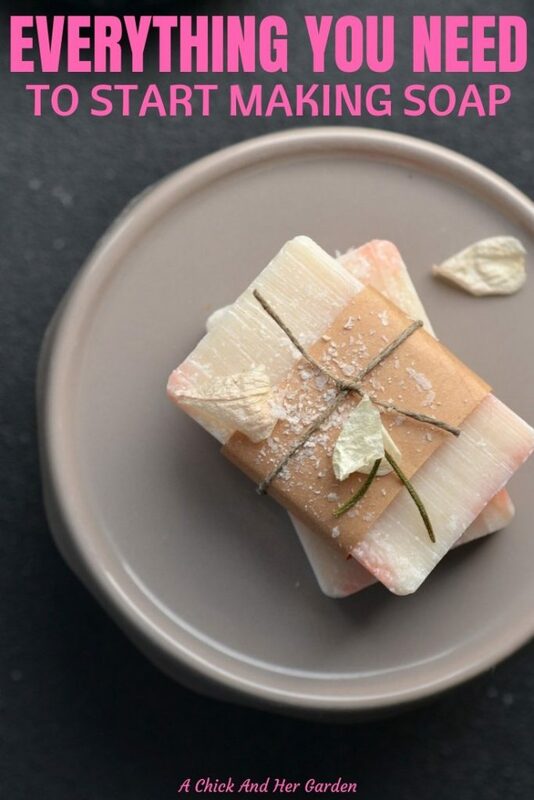 So, What supplies do you need to make soap? That’s a really easy question to answer! If you’re just getting started there really are only 11 items that you need to make cold process soap! For any recipe these are your basic necessities and what they’re used for. A dish used only for measuring out lye. Lye is necessary in all solid soap recipes accept for melt and pour. It creates the saponification in your soap. Lye is also a caustic material and should not be poured into any dishes that you would later use for food preparation. I already had this set of food prep dishes, so I took one and labeled it specifically for the use of lye. Soaps have two basic parts. A liquid/lye solution and a combination of oils and butters. This measure cup is used to measure out your liquid, which the lye will be sprinkled into. Your soap ingredients will need to be measured out with a kitchen scale. This one is perfect for your soap needs! Lye is a chemical that you don’t want to mess with! Not only is it not safe for consumption, but once mixed with liquid it reaches temperatures of 150°F or higher! Protect your hands with gloves. I like using these Nitrile Gloves. Splashes can happen and you definitely don’t want any of this in your eyes! Make sure to grab a pair of safety glasses before you get started. Your liquid/lye mixture and your oils need to reach temperatures between 90 and 115°F before they are combined. This thermometer is perfect to have on hand when checking your temps. A saucepan is used to measure out and heat your oils. The liquid/lye mixture will be added to the oils in the saucepan when the appropriate temps are met. This saucepan is the perfect size and totally affordable. Your oils and liquid will need to be blended and stirred with an emulsion blender. You don’t need the $100 stick blenders that I’ve seen out there. This is the one that I use and it is more than enough and nowhere near that much! For most soap recipes all you need is a loaf mold. This one will fit most of my recipes and it comes with a silicone liner! If you end up with a mold that doesn’t have a liner, or make your own wooden mold you will need to line it. Freezer paper cut to size is perfect for lining wooden molds. OK, so I thought I had 10 must haves but it’s actually 11 and I’m not sure how I forgot the most important! My number 1 soap making tool has to be Jan Berry’s Natural Soap Making eBook Collection! I refer back to these books EVERY TIME I write a recipe! They’re not only filled with recipes, there are guides for oils and liquids and how they affect your soap. 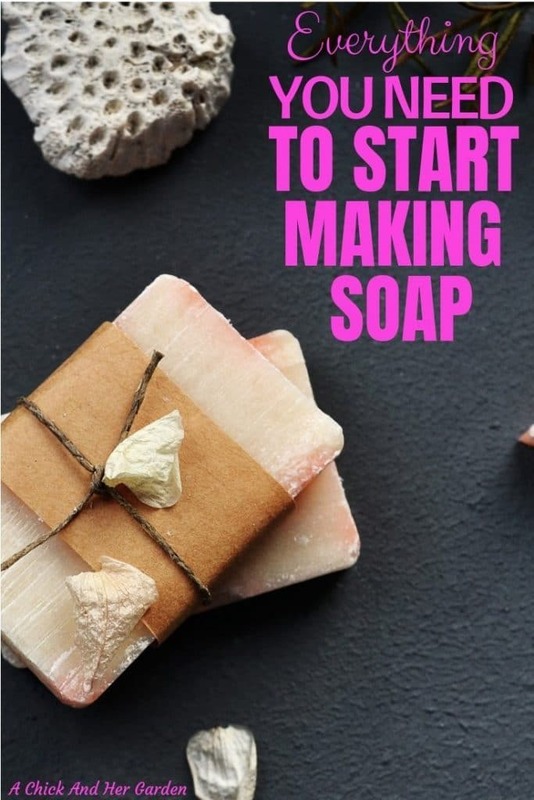 These eBooks also have step by step tutorials and are generally jam packed with Jan’s knowledge on soap making! You have to have this series in your toolbox for soap making! So now that I’ve answered what supplies do you need to make cold process soap, do you think you’re ready to make your own? Give my Cucumber Mint Soap recipe a try! What made you decide to try your hand at soap making?? Tell me in the comments!